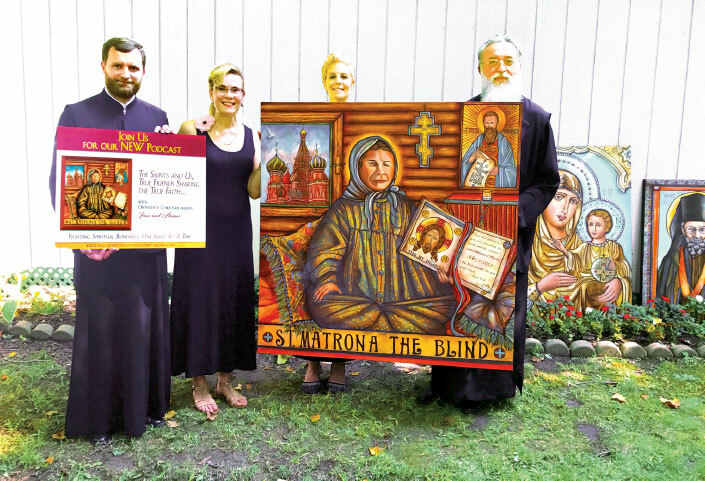 Serbian Bishop Longin (far right) holding Ariane's painting of Saint Matrona the Blind with Fellowship Co-Founder Francene Samaras Foster immediately following official blessing of the Fellowship by His Grace Bishop Longin. 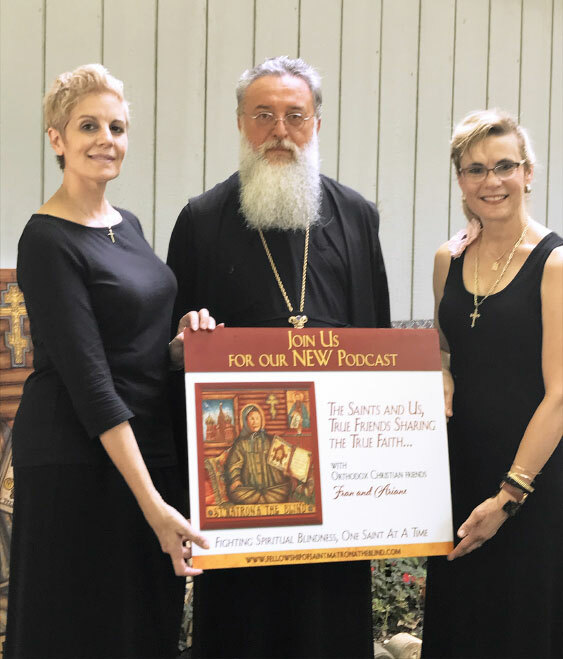 Father Aleksandar Vujkovic of Saint Petka Serbian Orthodox Church, located in Nashville, Tennessee, is also pictured (far left) holding Ariane and Francene’s new Fellowship podcast debut sign. Serbian Bishop Longin (center) holding The Fellowship of Saint Matrona the Blind podcast sign with Fellowship Co-Founders Francene Samaras Foster and Ariane Trifunovic Montemuro. Finding a deep abiding friendship with fellow Orthodox Christian Francene Samaras Foster and through their shared love of and respect of the Saints, Ariane and Francene have embarked on a regular online recorded dialogue where they discuss how the Saints have enriched and informed their lives. Through the inspiration and intersession of Saint Matrona the Blind, whose spiritual wisdom and insight helped those around her, they hope to honor this incredible Saint’s memory and legacy with thought-provoking conversations about other Orthodox Christian Saints. Their hope is to bring that sense of hope and faith to those who become inspired by their impressions and experience of the Saints Francene and Ariane discuss. Ariane and Francene thank Bishop Longin for blessing The Fellowship of Saint Matrona the Blind — established with the main goal of assisting, supporting, and building current and future Orthodox Christian monasteries, as well as teaching people about the Orthodox Christian faith. The Saints & Us — True Friends Sharing the True Faith. Visit The Fellowship of Saint Matrona the Blind to learn more or to listen to a recorded audio discussion about the Saints.